You may think that weddings are virtually the same as christening photography and christening videography. While it is true that the events are similar in many ways – the setting, the families, the familiar ceremony, christenings have a different feel altogether as the parents are typically more relaxed than a bride and groom, and that makes a world of difference to a professional photographer. 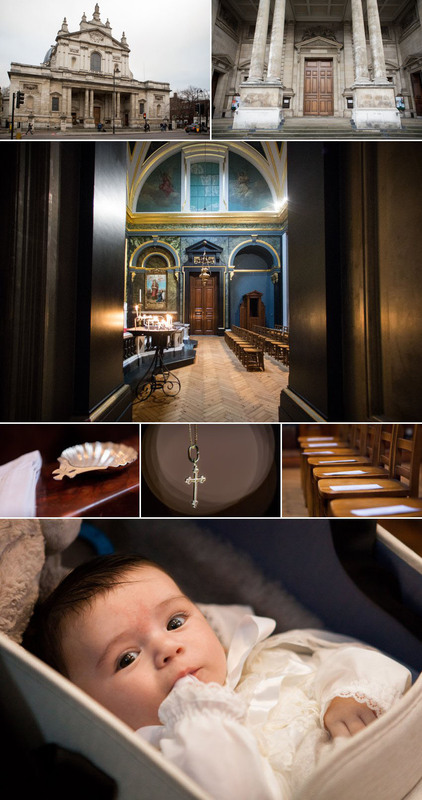 Just look at how beautiful the family is in these images of this christening at Brompton Oratory in Knightsbridge or, to use its official name, the Church of the Immaculate Heart of Mary. Not even the drama of this fantastic backdrop can detract from the innocence of this lovely baby, nor the delight of his parents at his existence. It goes to show that, no matter how spectacular the setting – and Brompton Oratory is wonderfully decorative – the love a parent has for their child is always more impressive. It was a small but happy congregation who gathered to watch Emilio receive the holy sacrament of Baptism. The Brompton Oratory is a magnificent large neo-classical Roman Catholic church in Knightsbridge, London. It was built in 1884 and has a grand style typical of formal buildings of the late Victorian era, but it is warm and welcoming. Structures of this age and style always present challenges to a Baptism photographer simply because they were not designed for photography. The position of the windows and columns can create shadows where they are not wanted, and candles, no matter how romantic, do not always provide ideal lighting. We could not have asked for a more photogenic baby than Emilio. He was so relaxed with a ready smile and, although there were a few tears partway through the ceremony (I can count on one hand the christenings I have photographed where the baby has not cried at some point! ), they did not last. A technique for christening photography we always try to use is to get photos of the baby with various family members before the ceremony before the child becomes tired and overwhelmed by being the focus of attention for so long. It is not always possible for parents to time the service around when their child is generally at their most alert and happy, so we do our best to fit in around naps and times when a baby is expected to be grouchy, so we can get the photos that show them at their best. Some of our favourite images of the day include Emilio clutching his candle, and a candid shot of his mother holding him in the air. The juxtaposition of the innocence of a baby’s laughter against the grandeur of the church’s dome underlines that nothing is more valuable than family.